One of the things I like* about Bates Motel is that instead of setting it in the past, it's more like...what would Norman Bates, teenage boy, be like today? (and of course Norma!) Bates Motel is kind of strange if you think about it...it's inspired by characters from a film based on a book based on a real life person. And when the show was first announced I was doubtful (though still totally going to check it out!) because it just seems like there are no new ideas. Also, how much story could there really be? A lot it turns out. Some of it really interesting, some of it more like a failed attempt to create intrigue and mystery. I find the show entertaining and a good time and I almost hesitate to write from this super serious point of view about it, but I just can't help myself. I guess it's credit to the original author of Psycho and Alfred Hitchcock's interpretation in film that they managed to create a character in such a state of mind that you would wonder about him and what made him who he is. But as the show has progressed, it's not actually Norman that I'm interested in so much as it is his mother, Norma Bates. And...I guess that makes sense? In Psycho, the only things we know about Norma is the short brief story told to Marion Crane's sister about her death. Otherwise, she's nothing but a corpse, the "Mother" in Psycho is really a manifestation of Norman himself. So while the story of Psycho largely erased Norma from the narrative, Bates Motel seeks to fill in our understanding of who this woman might have been, Norman's first victim. (though Bates Motel would most assuredly have us believe she was not the first!) Norman has some pretty confused ideas about sexuality and his Madonna/Whore complex comes raging into violent reality early in the show. While the blame can't entirely be placed at Norma's feet, I think it's pretty clear Norman is mentally ill, she certainly doesn't help. Their relationship is unhealthy, she does demonstrate jealousy and suspicion of other girls in his life and her efforts to protect him actually harm him. She won't let him see a psychologist without also sitting in on the session, she hides his blackouts from the world, and she covers up his crimes. I won't argue her actions are motivated from love, but I do think they are motivated by the only way she knows how to love, which is to say, not very well at all. Norma herself, though, is a victim of abuse. Of lifelong trauma, I would argue. The very first episode has Norma facing a brutal sexual assault that sets off a series of events. She's a survivor as best she knows how to be and sometimes that's not very well. But..I don't know, despite all of this I feel so much for the character and I think the show has done a good job of reclaiming her story. It also helps that Vera Farmiga, who brings her to life, is giving it her all. Norma feels alive and real. She's equal parts adorable and irritating and sympathetic. Norma is a victim before she's an abuser and the whole of that is a very sad thing to me. The extent of Norma's background, however, we don't begin to understand until the finale of the season when, at a completely inappropriate time and to a completely inappropriate person she confesses the truth of her history. But I'm getting ahead of myself. For the whole of the season, Norma's story has been one of struggling to get control over her life. This extends, unfortunately, to the way she manages Norman. But the very opening episode suggests that the town they've moved to is not that great and when the former owner of the motel aggressively breaks into her house and sexually assaults him, her response is to kill him and cover up the evidence in Psycho Bates style. But of course that goes horribly wrong and evidence is uncovered by people who would seek to exploit their knowledge of it. Most notable is the deputy sheriff who finds himself attracted to Norma with a desire to protect her. Norma thus finds her fate dependent on this guy (who is very shady) and his attraction to her as a woman. When Norma thinks she's finally going to go to jail, she gives us the first hint of the kind of life she's had when she breaks down in front of Norman. "You don't understand, Norman. My whole life I've had to put up with things." Even though, yes she killed this guy and ill advisedly attempted to cover it up, the man was brutal and assaulted her. It's hard not to feel for her even while being annoyed by the way she is always trying to stay in control. And that's really the story of Norma throughout the season. She is trying, trying so hard to maintain a measure of control over her life and she keeps getting beaten down. As soon as one horrific ordeal settles, another pops up. Over and over, men attempt to control and manipulate Norma. Yes, it is always men. It makes sense that she in turn controls and manipulates Norman. She is definitely emotionally abusive, there is no question. But Norma didn't arrive as an abuser in isolation. She herself was horrifically abused. In the finale, Norma thinks she might die. She feels that she's lost the latest battle and her ever fragile grip on control is quickly eroding. 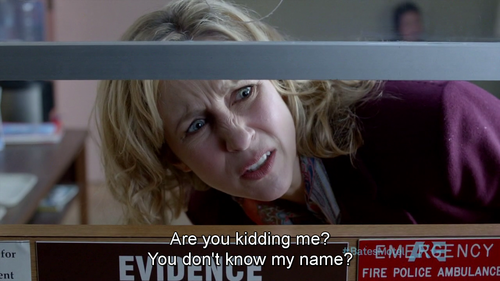 Thanks to Vera Farmiga it's almost amusing to watch her as she first attempts to speak with a therapist and then unleashes her rage at a man who is mildly rude to her in the street. (this was such a great character moment, because she is at first apologetic for running into him and when he retorts back, she just explodes in rage. She is just so sick of the world shitting on her that when she's sorry for even the littlest thing and it's met with contempt, she just can't keep her feelings in any more. A++) But it's also heartbreaking to watch her growing fear. Even though the Sheriff tells her to trust him, she doesn't, because Norma doesn't really trust anyone but herself. Fearing she might die, she breaks down in front of Norman and tells him the truth of how her brother sexually molested her growing up. It's one of those scenes that's just so uncomfortable to watch because you can empathize with Norma's sudden and intense desire to be really known before she might possibly die, but it's also the wrong time and the wrong person. Poor Norman! He's about to go to the dance! And his mother drops this HUGE revelation on him. But it's also a key scene because it continues to show us how Norma lacks all appropriate boundaries with her son while also giving us a huge key to her past and understanding her behavior of the season. Norma is constantly trying to improve their lives and hoping things will get better. Even at the end of the first season, she thinks they have finally put their troubles behind them. The sad thing is, though, that of course they haven't. Their external troubles are nothing in comparison to the darkness and damage they each have inside themselves. It's sad to watch Norman's progression as a killer and Norma's misguided attempts to fix and make right her life, knowing that in the end, she's only perpetuated a cycle of abuse that will eventually claim her life. *a lot of people don't like this! But for me it opens up the story so much more than it if tried to be a strict origins story.